This pin contains instructions on how to operate your 3-D glasses and features Kermit the Frog leaning on a pair of 3-D glasses. 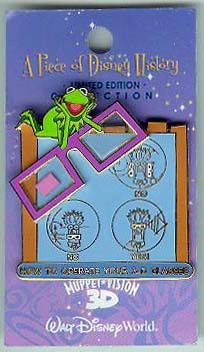 The pin contains an actual piece of the original frames from the 3-D glasses used at the Muppet*Vision 3-D attraction. This attraction opened on May 16, 1991, and is located in The Backlot at Disney-MGM Studios. The pin was designed by Disney Design Group Artist Mark Seppala. This is the third pin in this 'Piece of Disney History 2005' collection. Released at Walt Disney World on 15 March 2005. Only 2500 of this pin were produced, and it was only sold at Walt Disney World. "Maelstrom" is a 10 minute longboat journey through the scenery and history of Scandinavian Norway in a replica Viking longship. Along with the scenery the boat ride features a North Sea storm, and a very small waterfall drop, though it seems a lot larger than it actually is because the ride is relatively dark in places and helped by a drop backwards, exaggerating the scale of it. Your journey ends at a quaint, calm fishing village, where you will then be taken into a theater, and be presented with a short movie about Norway and its people. 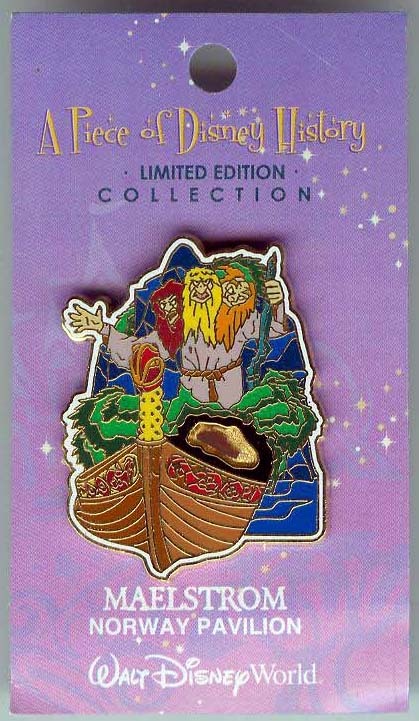 A piece of Disney History with the pin featuring the Norwegian High-Seas Adventure, Maelstrom. This attraction is located in the Norway Pavilion in World Showcase at Epcot®. It opened on July 5, 1988. This is the fourth pin in this 'Piece of Disney History 2005' collection, released at Walt Disney World on April 15, 2005.. The pin was designed by Disney Design Group Artist Mark Seppala. Only 2500 of this pin were produced, and it was only sold at Walt Disney World. Located within the Camp Minnie-Mickey area of the Animal Kingdom, The 25 minute Festival of "The Lion King" takes place in the Campside Circle part of Camp Minnie-Mickey and features live music, tribal celebration song, dance and storytelling, including most of the favorite characters from Disney's "The Lion King" animated film. Join the circle of life with this Limited Edition pin featuring the Festival of the Lion King show. This pin features a pieces of raffia trim from the Stilt Warrior's costume from this high-energy show. This Disney's Animal Kingdom® Attraction opened on April 22, 1998. This is the sixth pin in this 'Piece of Disney History 2005' collection, released on June 15, 2005. The pin was designed by Disney Design Group Artist Mark Seppala. Mickey and Goofy are pictured in this Limited Edition pin featuring the world-famous Jungle Cruise. They are reenacting the "Trapped Safari" scene and have taken the places of the original Safari members. 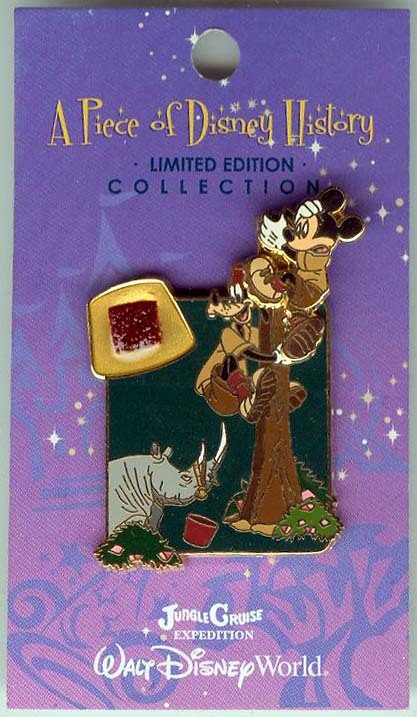 This pin features a piece of a hat from an Audio-Animatronic® Safari figure from this scene. This original attraction opened in Adventureland® at the Magic Kingdom® Park on October 1, 1971. Mickey Mouse is a pin-on-pin attachment to the pin. 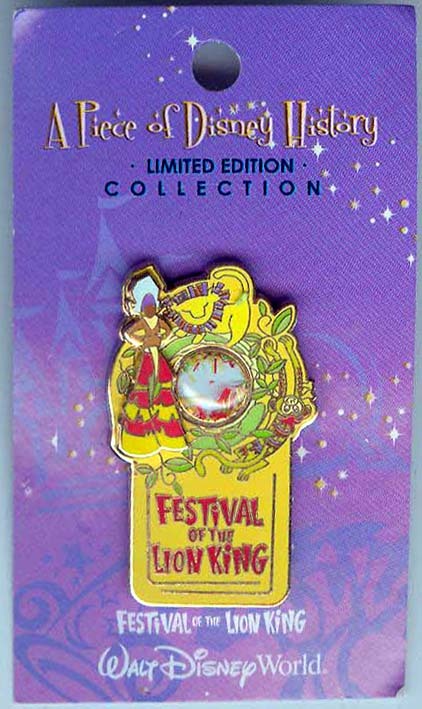 This is the seventh pin in this 'Piece of Disney History 2005' collection, released on July 15, 2005. The pin was designed by Disney Design Group Artist Mark Seppala.